Swedish citizens of Middle Eastern origin with criminal records are studying at the Medical University in the Bulgarian capital Sofia to become doctors, dentists and pharmacists. Unlike the rap sheets, their secondary education diplomas used for their enrollment are quite dubious, an investigation by Bivol in partnership with colleagues from the Swedish TV SVT reveals. The scheme “enrollment against solid amounts” remains in operation even after the bust by the Specialized Prosecutor’s Office of an organized crime group in the Medical Academy in January 2018 and the declaration that was a threat to national security. The following students with Swedish passports – Shahab Shahdadzaei, Jamal Baluchi, Ahmed Shahim Homa, Blerta Avdiu, Bashkim Muzaqi, Ilir Muzaqi, Daniel Dashtipur, Ziyad Taregh Ahmad, Bastret Zegrova, and Adnan Marwan Abdullah Adnan – are studying to become doctors, dentists and pharmacists at the Medical University of Sofia. The price for the studies in the English language is EUR 8,000 per year. 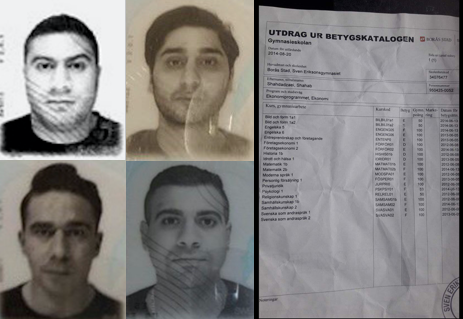 All of them (except for Ziyad Taregh Ahmad) are from the small Swedish town of Borås, where they have somehow graduated from high school with low grades that cannot qualify them to study medicine. The young Swedes move in criminal circles, and some of them have left less or more of a serious imprint in Swedish criminal chronicles and court files. There are people in the group who have been investigated and sent to trial for illegal drug possession, beatings, disorderly conduct, theft, financial fraud and even murder. In Bulgaria, nothing prevents people with such backgrounds from paying and enrolling as students at the Medical University. From documents available to Bivol, it can be reasonably concluded that the scheme for admission of foreign candidates who present irregular and non-compliant with requirements applications and forged high school diplomas or diplomas without courses in biology and chemistry is still in operation at the Medical University. In the beginning of 2018, an operation of the Main Directorate for Combating Organized Crime (GDBOP) and the Specialized Prosecutor’s Office led to revelations of an organized crime group in Sofia’s Medical University dealing with admission of foreigners of Arabic, Iranian and other origin by charging EUR 50,000 per person. The Prosecutor’s Office accused the now-former President of the Medical University, Vanyo Mitev, of being the leader of the group. According to the Prosecutor’s Office statements, the fake students in this scheme have been citizens of non-European Union (EU) countries. “By receiving the status of full-time students, they receive the status of temporary residents, which entitles them to move freely within the EU.” Rumyana Arnaudova, spokesperson of the Prosecutor GeneralIn the case of the Swedish citizens, however, residence and free movement in the EU are not relevant. As EU citizens, they can settle wherever they want in Europe. However, the Bulgarian university student ID gives them good reputation. There is another bonus, as against it and even only against a certificate of enrollment, the Swedish state agency, Centrala Studiestödsnämnden (CSN) grant generous student loans, which can provide a very nice life in Bulgaria, and may even oil the “exam machine” up to a doctoral degree. The scheme operates under the new President, Prof. Victor Zlatkov as well. Bivol’s sources claim that in the last school year, a courier mail has been sent from Cyprus to the Office of the President of the Medical University with documents for the admission of foreign citizens. A power of attorney letter has been attached to each documents giving the right to another person to submit the admission application instead of the candidate. Then, the received documents have been pushed behind the scenes to accept these persons as students at the Medical University in Sofia. In addition to the Swedes, we also received information specifically about the British citizen of Arabic origin Reichmanul Imran Rob. One of the above mentioned Swedish students has a permanent residence in Bulgaria. This is Ziyad Taregh Ahmad, born in Iran, with personal number 861213-1030, who, according to Swedish registers, lives in Sofia. Ziyad Taregh Ahmad currently studies “Health and Sport” as a second-year student at the Medical University. His criminal past includes a murder investigation in 2015, for which, however, he has not been charged. His only conviction is from 2008 and the sentence was one month in jail for car theft. In addition, the court penalized him with a fine on the income he could not prove legal. Precisely Ziyad seems to be the lead for the other “Swedish students” from the same town of Borås, who move in the same criminal circles and have been enrolled at the same time and after him at the Medical University. Bashkim Muzaqi (941108-3596) and Ilir Muzaqi (961208-6737), for example, are less studious. Both are in the crosshairs of the Swedish justice for illegal drug use and driving without a license. They have managed to enroll as university students in Sofia, despite their mediocre high school grades. They then have not paid the tuition fee of EUR 8,000 and have disappeared. Their whereabouts are unknown. Blerta Muzaqi (the younger sister of Ilir Muzaki), has, however, enrolled to study dentistry in 2018 and is currently listed as a full time student. Other Medical University students have “specialized” in their homeland – Sweden in borrowing loans that they have not repaid for which they have been sent to court. Currently they are successfully borrowing new ones on the pretext that they have to finance their studies in Bulgaria. Daniel Dashtipur (880122-7417), a second year medical student in Sofia, has been forced by the court in Borås to return to GE Money Bank SEK 54,092. Once enrolled as a student in Bulgaria, he has successfully applied for a student loan in the amount of EUR 26,000. Bastret Zegrova (a man of Albanian origin) owes a total of SEK 60,000 to a variety of financial institutions and has numerous convictions for reckless driving. This has not prevented him from borrowing a student loan in the amount of nearly SEK 460,000 (EUR 45,000) after showing a university student ID in Sweden. Another student, Shahim Ahmad Homa (970226-8179), who has been caught in the Borås high school with a folding knife, has also been listed as a threat to public order. The court, however, believed his account that he had found the knife and intended to hand it over to the school guards. Shahim Homa has enrolled as a university student in 2017 and has managed to borrow a student loan in the amount of EUR 16,700. The most interesting profile is that of Shahab Shahdadzaei (950425-0052), who since 2017 has been enrolled in a master’s degree program at the Medical University and is listed as a full time student with paid education. In 2011, he has been investigated for robbery together with Elias Absalan (950112-9531). Absalan is known as a jihadist who has fought for Islamic State in Syria. After his exploits there, he has returned to Borås where he has attracted the interest of the Swedish authorities. Both have gotten away quite lightly as Shabab has been exonerated while Absalan has been sentenced to 150 hours of community service. Documents from the case file show that they are childhood friends. In addition, Shabab has been a murder and money laundering suspect. During this investigation, the police found SEK 137,000 under his mattress. The Prosecutor’s Office, however, failed to prove Shabab’s guilt in court. His only convictions are possession of illegal drugs (several times) and reckless driving. This long rap sheet has not caused him trouble in enrolling as a student in Sofia and then borrowing a student loan in the amount of EUR 25,000.
Who and how admits students without diplomas? A common denominator for all those listed above, all of whom have more or less serious criminal past, is their dubious performance in high school. Students with report cards such as theirs (which journalists of Bivol and our colleagues of SVE have examined in details) would at best have access to a school of the community college type or a technical school, but not to a master’s program for doctors, dentists and pharmacists which requires solid knowledge of biology and chemistry. Why the validity of the Swedish diplomas has not been verified and how exactly have these people been enrolled with such low high school grades – these are questions to be answered by the President’s Office of the Medical University. When approached for comments, the Ministry of Education stated that there is a check of the validity of diplomas only for potential students outside the EU, while for those from the EU, the decision is left to the autonomous Universities and Colleges. Bivol sent questions about these practices to the President’s Office, from where we were curtly referred to the Dean of the Medical Department. After we insisted that the students had been enrolled in the Medical, Pharmaceutical and Dental Departments of the University, not only in the Medical one, no answer followed. The National Security Agency (DANS) also failed to provide a response to the question whether the above persons have been the subject of investigations for terrorism and whether there are signals against them. Although there is a lack of specific evidence of the involvement of these individuals in the jihadist circles in Sweden, except for Shahdadzaei, the unusual concentration of students of Middle Eastern origin, as the prosecution has also pointed out, should attract the interest of the secret services. “This channel could actually be used for the purpose of terrorist organizations and illegal trafficking of migrants… The danger is defused. The criminal channel no longer exists,” Rumyana Arnaudova said in January 2018, while explaining the operation against the illegal enrollment of students at the Medical University. A year later, however, evidence shows that this conclusion of the Special Prosecutors was, to say at the least, too bold and too premature.